Google has revealed its first major foray into gaming with a cloud-based streaming service called Google Stadia. The service allows you to play AAA games directly through your Chrome browser, or on your phone or tablet, seamlessly switching between them. Here's everything we found out about Google Stadia at its GDC 2019 reveal event. Essentially Google Stadia is a service. There's no console box for you to own, as the game is played in a datacenter and streamed to your device. That device can be a laptop, desktop, phone, tablet or TV (with a connected Chromecast Ultra). Games will apparently be streamed at 4K resolution with HDR and 60fps at launch, but with a plan to improve to 8K 120fps in the future. You can play with any currently available USB controller, though there will also be a Google Stadia controller which connects through wifi directly to the datacenter, instead of the TV/chromecast. This ensures low latency or input lag. To begin a game, you need only click a link which may be included in the description of a YouTube video, or wherever you saw the trailer of the game you wanted, and that's it. There's no downloading, the game begins immediately. You can save progress and pick up where you left off on any device connected to the Google Stadia service. What features does Google Stadia have? As it runs on a datacenter and streams the gameplay to you, there are a number of unique features in Google Stadia. A second simultaneous stream alongside your gameplay can be sent directly to youtube. This allows people to save and upload footage instantly, or streaming to audiences with no lag. Those audiences can also join the game you are in via Crowd Play, which places a link below the gameplay allowing you to join a lobby to be placed into the next game. Online multiplayer is also completely cross-platform (publisher/developer dependent) with reduction in player ping discrepancies due to all being on the same Google backbone. There is a Google Assistant button that activates a microphone in the controller to let you search for help and guides on the internet, which it will display in real-time alongside your gameplay without you having to exit the game. There is also a share button, that on top of allowing you to save or send footage can activate a feature called State Share. State Share saves the game at an exact moment in time, gathering information like player position and velocity, player health, inventory data, everything you'd expect from a savestate in an emulator. It then allows you to post a link to that savestate which other people can click on and begin playing from the exact moment you saved. Instantly. Honestly that sounds like black magic. 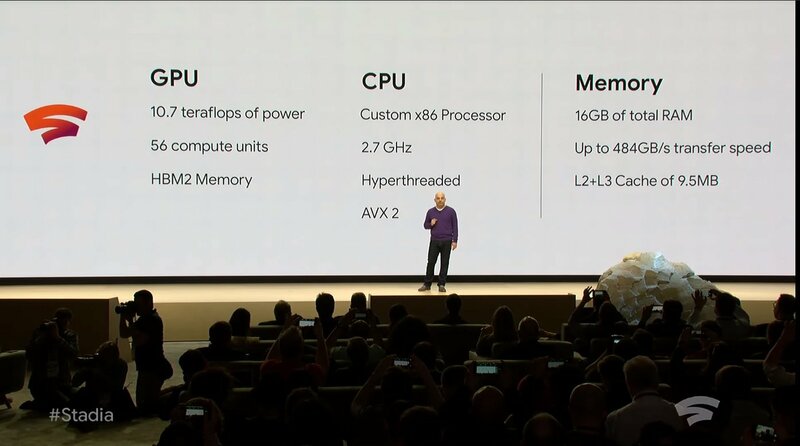 Google Stadia runs on the same datacenters that Google uses to serve search queries, although these ones have been upgraded with some serious graphical hardware. In order to pump out 4K resolution quality, your game is rendered by multiple GPUs at once which helps with compute-heavy graphical effects such as fluid deformation. These datacenters apparently offer a GPU performance of 10.7 teraflops, a number of computing operations much much larger than the current generation of consoles. A PS4 Pro is capable of 4.2 teraflops while the Xbox One X manages 6.0. The datacenters run on Linux, with a Vulkan graphics API, and Google have partnered with Unity, Unreal Engine, Havok physics engine and many other toolmakers to allow a wide range of developers to publish on the system with appropriate support. 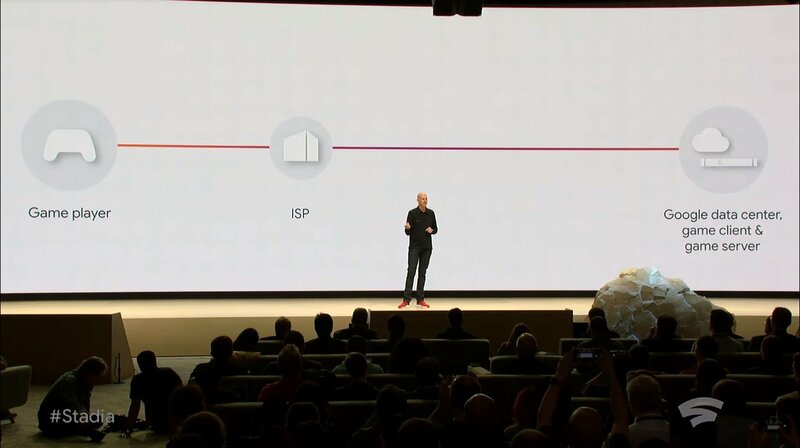 Input lag will apparently not be a problem with Google Stadia, as they'll use Alphabet's considerable internet presence to ensure there is always a local datacenter with a short connection. The Stadia network runs on fiber-optic links and sub-sea cables, with 7,500 edge node locations around the world. 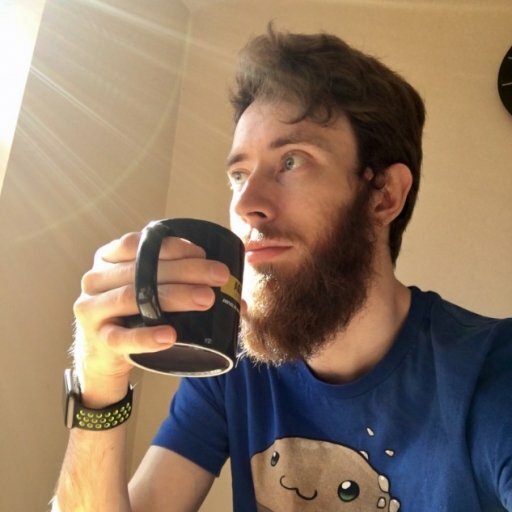 The reasoning goes that compute resources are closer to players, reducing lag and improving performance. But we'll reserve judgment until we see some real world tests under load. What games will be on Google Stadia? Google only showed a few of the games that run on Google Stadia at the moment. The first is Assassin's Creedy Odyssey, which was the test rabbit for their original Project Stream last year. Executive Producer at id Software Marty Stratton also confirmed that Doom Eternal would be on Stadia at launch, running at 4K with HDR at 60fps. Other games included Rime from Tequila Works (which demonstrated a strange Machine Learning artstyle replacement, like an Instagram filter) and NBA 2K. When does Google Stadia launch? Google Stadia will launch later in 2019, first in US, Canada, UK and most of Europe, with more information being presented during the summer. We expect there'll be a showing at E3 or soon after to explain more about how the system works or an expanded roster of supported games. Now that you know what Google Stadia is and when it launches, how about stick around for some more of our in-depth explainers and guides?